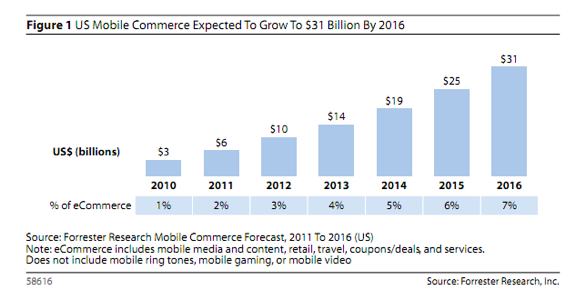 Forrester Research has just released a new report this morning projecting U.S. mobile commerce to reach $31 billion by 2016, growing at a 39% compound rate. But the report says that mobile commerce is only expected to be 7% of overall eCommerce sales by 2016 and only 1% of general retail sales. This year alone, mobile commerce sales are expected to reach $6 billion as more consumers look to their smartphones to make purchases. Forrester says that most retailers are continuing to invest in mobile apps and mobile optimized sites. In a recent survey of major retailers, the firm founds that only 9 percent of online retailers didn’t have a mobile presence or strategy. Forrester says that there are a number of factors that will help drive growth. First, as mobile security improves, more consumers will feel comfortable inputting financial data into phones. And as smartphones usage increases, more consumers and retailers will look to mobile as an e-commerce platform. Plus as more brick and mortar stores create a web presence (as competition from online retailers heats up), mobile will inevitably be part of this strategy. To put the $31 billion estimate in perspective, the research firm also recently estimated that both US and European online retail (representing 17 Western European nations) will grow at a 10 percent compound annual growth rate from 2010 to 2015, reaching $279 billion and €134 billion, respectively, in 2015.